LOCATION, LOCATION- BEAUTIFUL LOWEST PRICE HOME IN HAWTHORNE!! 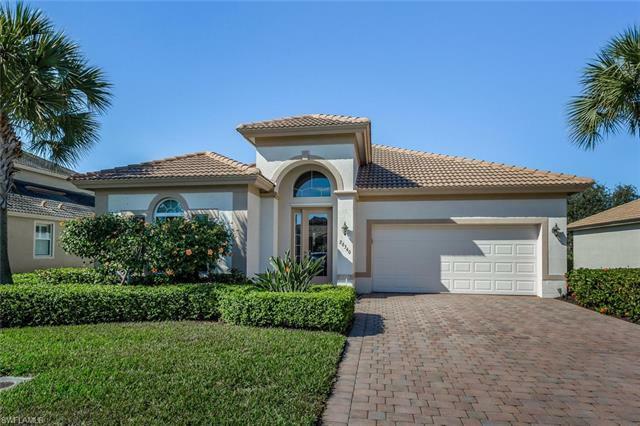 This well maintained OPEN FLOOR PLAN is freshly painted, a Pulte-built home offering a nice size covered outdoor area, PRIVATE EXTENDED PAVERED LANAI and an ELECTRIC SUNSHADE. This home sports upgrades which include TILE FLOORS on the diagonal in living areas, WOOD CABINETRY THROUGHOUT, LEVOLOR WINDOW TREATMENTS, high ceilings, arched doorways and windows in some rooms. The great room and dining nook both face the lanai and peaceful landscaped area. The Master Suite includes a separate tub, large shower with rain shower head and a multifaceted hand-held shower head, and more and dual sinks. There are 3 FULL bedrooms which is great for guests and family or a possible den/bedroom. IN THE HEART OF BONITA SPRINGS..Hawthorne is a beautifully mature, quiet and secure guard-gated community with several lakes, 2 community pools and spas, 2 fitness rooms, community room, tennis, many socials, groups, clubs. Conveniently located 6.5 MILES TO BEACHES, MINUTES TO restaurants, Publix, Fresh Market, Coconut Point Mall, Miromar Mall, 20 MINUTES TO Southwest FL International airport, and with quick access to both Naples and Ft Myers. © 2019 Bonita-Estero MLS All rights reserved. Information deemed to be reliable but not guaranteed. The data relating to real estate for sale on this website comes in part from the Broker Reciprocity Program. Real estate listings held by brokerage firms other than Royal Shell Real Estate Inc are marked with the BR logo and detailed information about them includes the name of the listing brokers. Listing broker has attempted to offer accurate data, but buyers are advised to confirm all items. Information last updated on 2019-04-24.